Super quick meal. The thermomix has made food preparation so fast that now if the meal can’t be prepared in 10 minutes, it’s usually not on the weekday menu. Finding it more difficult to recall the meals made pre thermomix. This meal is what happens when one ingredient is missing. Tonight’s dinner was supposed to be wonton soup or dumplings. The filling had been premade in the thermomix earlier but on discovery my packet of wonton wrappers was well past expiry date, had to think creatively. Stuffed peppers is one of my mums favourite meals. 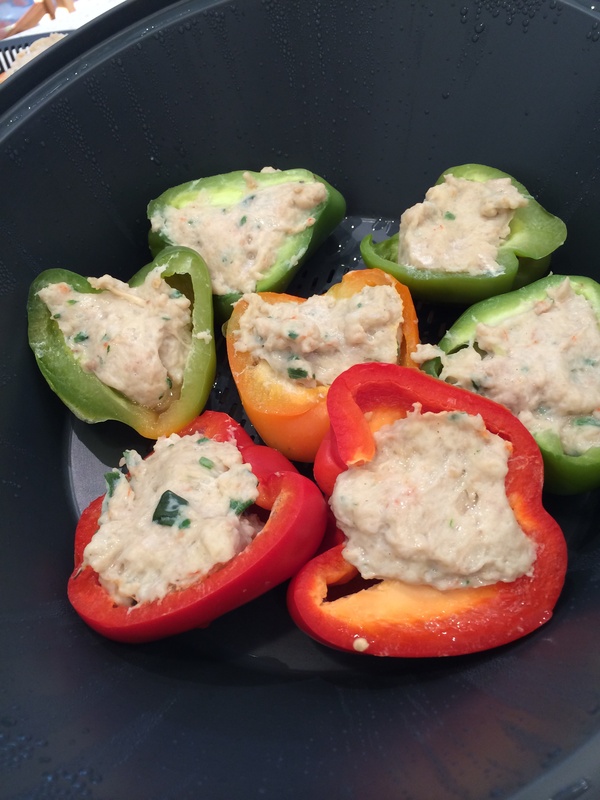 So I used the chicken and prawn filling to stuff halved and deseeded bell peppers. The peppers filled both layers of the.varoma tray and dish perfectly and steamed for 20 minutes at Varoma temperature. Dinner was cooked while I cleaned up. Served with rice and a small salad for the kids. Neither of them are keen on cooked capsicums yet but greedily scooped out the filling from the peppers. Delicious, the first time I made these the peppers were slightly over cooked, this time with slightly less steaming peppers still had a lovely crunch factor. Note I used 1.5 ltr hot water in the TM bowl before turning to Varoma temperature.